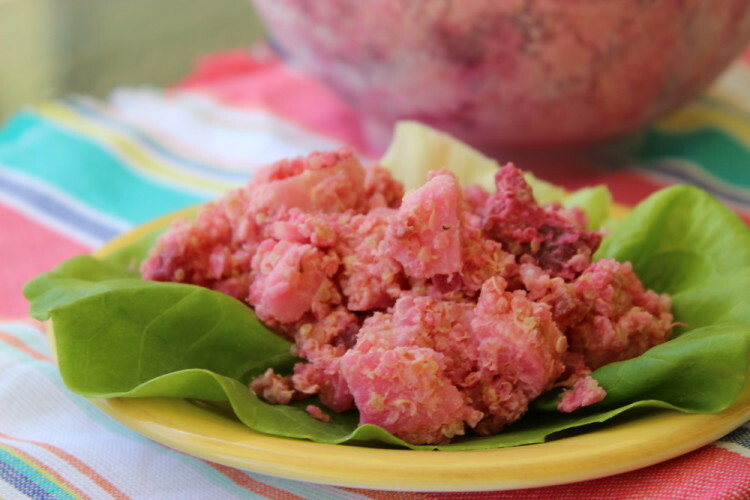 There’s a new kind of potato salad in town and it’s PINK! This Pink Potato Salad with Beets and Quinoa is far from the classic summertime potluck dish, but jam-packed with flavor and color. There are so many variations of potato salad. Bathed in mayo, vinegar-based, chilled, warm, filled with veggies, bacon-ized, or just straight up potatoes. I like my potato salad cold and creamy (with Greek yogurt, not mayo) but sometimes even that can be a bit normal, and well, boring. How about we get a little crazy up in here and add a few non-traditional ingredients to the mix? I’m talking quinoa, beets and hearts of palm. Are you intrigued? I sure was when I first heard of a potato salad that included beets. Yes, those earthy yet sweet, stain-your-fingers-purple root veggies that taste good in just about anything and everything — they even pump up potato salad! I may have been inspired by a traditional Dominican potato salad dish made by a local chef at last month’s South Florida Food Swap, but of course, being a food blogger means I have to change up just about everything to make it my own. Greek yogurt stands in for mayo (as is the case with any creamy dish I make), and hearts of palm take the place of hard boiled eggs. I don’t like eggs, but hearts of palm work because they mimic the look and feel of the hard boiled eggs seen in most potato salad recipes. I used red-skinned Idaho® potatoes to keep with the “pink” theme of the dish. The color is bright and vibrant, almost tropical. You can’t help but smile at a potato salad that is as pink as a new born baby’s bedroom. 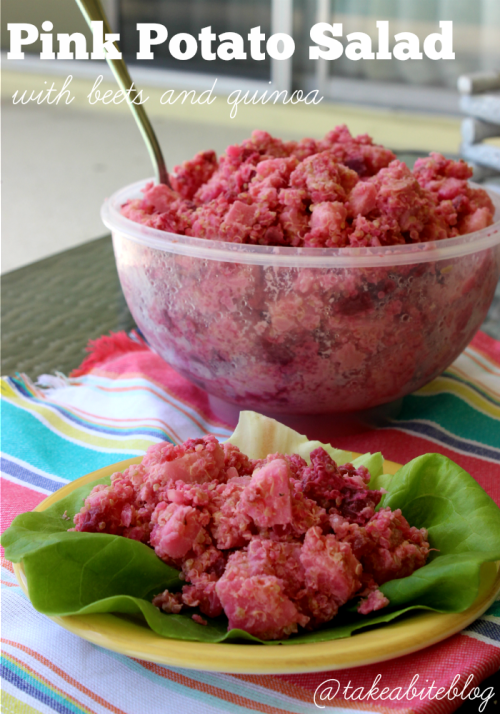 I’m entering my Pink Potato Salad with Beets and Quinoa into the Food and Wine Conference Idaho® Potato Commission Recipe Contest. Our mission is to come up with a recipe for a family-style dish featuring Idaho® potatoes. You still have time to enter! The first place winner will receive a $500 gift card and a ticket to this summer’s Food and Wine Conference — and you have a chance to have your recipe featured on the website! Click here for more details on how to enter, and get cooking — you only have until June 20th! Oh, and make sure to follow Idaho Potato Commission on Twitter, Facebook, Pinterest, and Instagram. 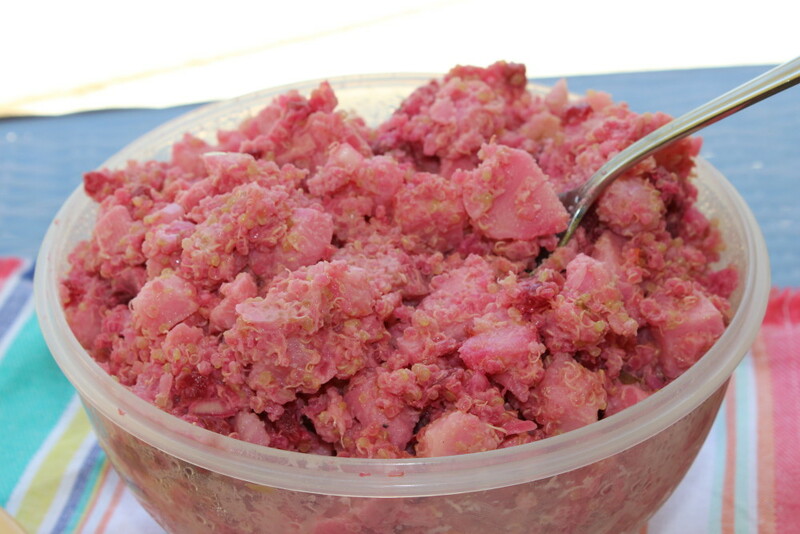 There's a new kind of potato salad in town and it's PINK! 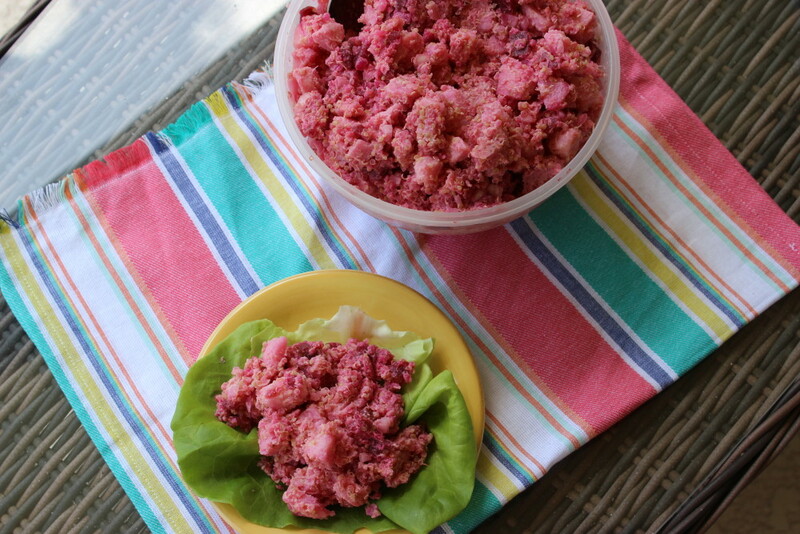 This Pink Potato Salad with Beets and Quinoa is far from the classic summertime potluck dish, but jam-packed with flavor and color. Fill a large pot ¾ of the way with water. Season with salt and bring to a boil. While the potatoes are boiling, add cooked quinoa, onions, hearts of palm and beets to a large bowl and toss to combine. Mix in the reserved beet juice, Greek yogurt and extra virgin olive oil. Remove cooked potatoes from water and allow to cool before slicing into small cubes. You may choose to peel them or leave the skin on — the skin may just fall off on its own. Add the potatoes to the bowl and mix very well. Even if you don’t enter the contest and win a ticket, you should still totally consider joining us for the weekend. It’s going to be SO much fun, and extremely informative. We’ve got a lot of great sessions and speakers lined up for our attendees this year. Register now using the code FWC15wizos and you can save $50! 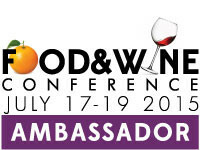 Disclosure: I am a brand ambassador and part of the committee for the 2015 Food and Wine Conference. I will receive a commission if you use the above promo code to purchase your ticket. Entrance into this recipe contest is an equal opportunity for all conference participants and I receive no advantage from being on the committee. Very creative …good luck in the contest.